On this date in 1944, six Spanish Jesuit missionaries were executed in Palau by the island’s increasingly desperate Japanese defenders. Fr. Elias Fernandez Gonzalez, Fr. Marino de la Hoz, and Br. Emilio del Villar were on hand to spread Catholicism in the island, which fell into Japan’s lap at the end of World War I and was therefore incorporated into the Asian hegemon’s economic plans. Taking no chances with these foreign proselytizers, Japan had them confined when the Pacific War broke out in 1941. 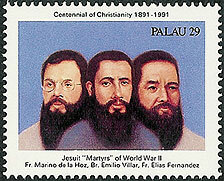 By 1944, with the writing clearly visible on the wall, they were joined by three other Jesuits captured from nearby Yap, now a part of the Federated States of Micronesia, Fr. Luis Blanco Suarez, Fr. Bernardo de Espriella, and Br. Francisco Hernandez. After a few months’ confinement, all six were summarily executed. Their remains have never been recovered; they were allegedly exhumed and burned shortly before Allied occupation, a bit of evidence-destruction similar to Wake Island. There was a Japanese officer arrested for these executions and other war crimes, but he committed suicide before he could face judgment.